Finally, you can let your A4 cash in on its pension! Anyone familiar with the Raspberry Pi scene will be aware of the Pi-Top, a laptop computer based around the credit card-sized computer that was developed after a successful crowd-funding campaign on Indiegogo in 2014 – and anyone familiar with the RISC OS scene will know that Chris Evans of CJE Micro’s and Fourth Dimension has, since London 2015, been talking about releasing a RISC OS version of the machine. 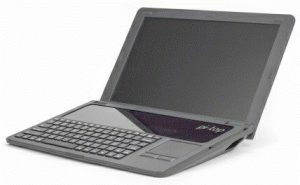 Today, the laptop has been formally announced as a 4D product – and it is, according to Chris, the first true portable RISC OS computer (i.e. with RISC OS running on ARM hardware, rather than under emulation) that’s been commercially available since the Acorn A4, which was launched in 1992. The name given to this new machine makes sense, but does seem a little odd – it is called the pi-topRO. It’s a similar nomenclature to previous computers produced by the Worthing-based business, such as the RaspberryRO and PandaRO, but given the RapidO name that was adopted for newer machines as the result of a competition – giving us the RapidO Ig and RapidO Ti – I would have expected something incorporating that; RapidO Pi-Top, perhaps, or just RapidO Top. 1366×768 (displaying 1360×768 under RISC OS) 13.6″ screen. A typical battery life of over ten hours, benefiting from power saving features. RISC OS included on a 16GB microSD card. PowerOff, a utility that shuts off the power when the computer is shutdown. SpkrSetup, a utility to enable the speaker. BatteryMon, which reports on battery usage, including an estimate of the amount of time the remaining charge will last. HID (aka Human Interface Device), with a custom setup file. Screensaver, which cuts power to the screen. A custom MDF to suit the display. The RapidO Top pi-topRO is priced at £499 including delivery – with no VAT, since this is a 4D product – and comes with either a Raspberry Pi 2 or 3 (depending on what the customer prefers – with the Pi 2 offering a greater range of software compatibility), a real-time clock module, and a speaker and nano WiFi Router. A small number available for immediate despatch, and more expected to be available in about a week – and for those people who have already purchased a Pi-Top, software and hardware upgrades are available separately – see the website for more details of these options. If you want to see the RapidO Top pi-topRO up close and personal, you will have an opportunity to do so in Horsham, at the Surrey and Sussex user group meeting, which takes place on Monday evening – Chris is paying the group a visit to demonstrate the new machine. After that, the next opportunity will probably be this year’s London Show, which takes place on 29th October, at the St Giles Hotel in Feltham.